One of our projects this week was given by the fabulous Hadar!! She posted this a little while ago, and of COURSE I had to do it!! Although, I didn't think through the background choice I guess...I should have reversed the colors. But I wanted to do orange and black since those are our school colors...lol. Didn't think about when black hair was going to be on black background...oh well...you live and learn, right??? Click HERE to get her pack! You can use them for End of Year or Beginning of year, so I might do it both!! 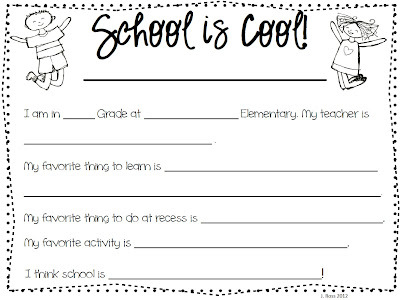 I'm interested to see how Reagan does her writing portfolio for the year with the kids - my goal next year is to save all these fun cute things we do and somehow send them home with the kids at the end of the year - do any of you do that?!?! I'd love to see how you do it! How BORING does my room look now?? But do you see that tall book shelf of books?? Those are my picture books - and I have THREE of those tall bookshelves FILLED with books that I have to pack - and that's not including the rest of my stuff. Why am I already packing when I have 8 days left?? Because I have SO MUCH stuff...seriously. I have about 12-15 of those bins already, and probably need about 6-10 more -ugh!! But on a happier note!! Today I got my May Birchbox!! wrinkle cream, perfume, hair restoration conditioner, ans some super pretty coral color nail polish! I am super excited about the nail polish!! For my toes...lol..since we all know I don't' have any fingernails! Maybe that could be on my Summer bucket list?? To stop biting my nails?? Click here if you wanna check it out - best part is, everyone gets something different!! "Aww....baby Cheese-it! He's my friend!!" There you have it. She knows that Cheese-It is her friend. They turned out great!! Good job! And your room is looking pretty sad! Ugh! I'm glad to know I'm not the only one with twenty some bins to fill! Such a horrible task!! I'd love to have you for my first linky!! I love the craft! Thanks for sharing the writing page. I think I just added something to my list of end of the year projects to do with the kiddos! So cute! And I am curious...what is Birchbox? I get random emails from them but I delete them. Would love to know more. I wanted to let you know I mentioned one of your fraction activities in my latest blog post! My room is starting to look like yours too! It is soo sad that I have to move rooms. My room is so bright and the room I am going to the sun doesn't shine into it as much. Ugh!! My Birchbox was COMPLETELY different than yours. What did I miss? WHY are you completely packing up your room? I have a ton to pack up too and you just made me realize I better get started haha! :) Love the baby Cheese-it story! Too cute! Everyone in the entire school has to pack up EVERYTHING!!!! We have a SERIOUS cockroach problem, so they are doing a complete debugging over the summer! I still have 3 weeks left, so I'm not even thinking about packing up yet! I am tempted to go back and buy some more. I'm trying to resist! haha! I am doing this with my second graders. Tomorrow we do the writing. They are loving it, because we just don't do enough fun artsy stuff in my room, even though I love that stuff! It was cute to see a couple who made their faces upside down which is fine, except they have bigger foreheads and lower ears! ha! some of mine almost did that too - I had to remind them about the skinny part being the chin..lol. I just may start doing the birch box thing...Looks like a lot of fun!! !